The Tallahassee Fuller Center completed two major projects beginning in the late Summer of 2011. 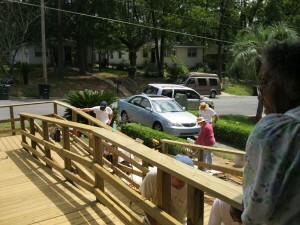 On four steamy work days in August and September, volunteers from Good Shepherd Catholic Church, United Church of Tallahassee, the Deer Lake United Methodist Youth Group, Holland and Knight Law Firm and Ability First constructed a handicap ramp for Ms. Thelma Harp. Ms. Harp, who recently has required a walker to get around, has lived in her home on Abraham Street in since 1954. At the project dedication ceremony on Saturday, November 19, Ms. Harp expressed heart felt gratitude to all those who turned out to help her. Ms. Harp watches volunteers complete the construction of her ramp. 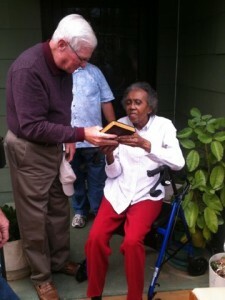 John Ryor presents a Bible to Ms. Harp at the dedication celebration on November 19th. The Bible was signed by all those present as an affirmation of their love and support of Ms. Harp. On nearby Alabama Street, a large contingent of volunteers from Bradfordville 1st Baptist Church, FSU Catholic Student Union and Good Shepherd Catholic Church constructed a new roof for Ms. Janie Jiles on Saturday October 1 & 8. The project was substantially funded by Bradfordville 1st Baptist Church. Thank you to all of the volunteers who gave of their time and talent on those two beautiful October days. Ms. Jiles project will be dedicated on December 3rd. 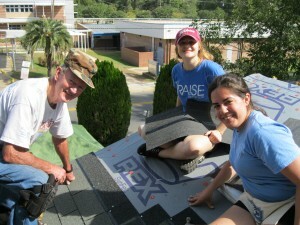 Bradfordville 1st Baptist volunteer crew removing Ms. Jiles old roof. 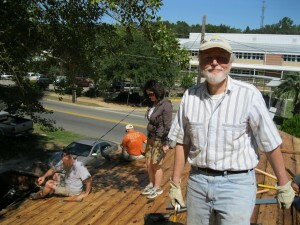 Volunteers from Catholic Student Union put finishing touches on Ms. Jiles roof.